As the 2005 Mule deer season got closer my friend Barry Englot, my dad Don Partridge and I were getting more and more excited. We once again were drawn to hunt in the “Big Muddy” area, south of Bengough, Saskatchewan. Our first Mule Deer hunt was in the same area 3 years previous and we had seem some tremendous bucks. Our first day was somewhat uneventful. Our second day we saw three 170 – 180 class deer together after a stop at the Bengough Co-Op and where Troy Haugen told us where to try. The next morning we were driving South when we noticed a big buck just off the highway. We made a quick plan, Barry would walk back from the road heading East, Dad would walk back from the East and I would go to the middle. It had started to snow hard by now which would eventually work in our favor. As I slowly made my way to the edge of the “Big Muddy” I could only see about 75 – 100 yds in the snow. I was slowly working my way to where we had seen the 3 deer the day before. I was almost there and I stopped and for some unknown reason started to walk back on my tracks. After a few steps, I stopped and looked down on the ledge 100 feet below. Something looked out of place in the buck brush. I wiped my glasses and cleaned the snow from my scope. I shouldered my 30-06 to have a better look. Their in the buck brush was an antler blending in. The odd looking brush started to rise, as did my heart rate. I knew in an instant this was a deer of a lifetime 150 feet away from me. My bullet struck home and down he went. I was dumbfounded with excitement. I tried to reach Dad and Barry on the 2 way radios but no one could hear me, even though we were less than a half mild apart. Finally all Barry could hear on the radio was Dad, Dad, I got a big one! As Barry walked up he was amazed. Finally we got Dad on the radio and Barry said it was at least 180. Wow! 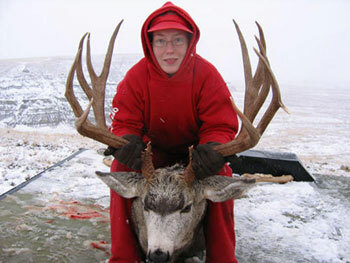 We finally loaded the deer and headed back to the Co-Op to show Troy and the other workers. The first question when we got there was which one of you ‘guys’ got him?. Barry and my Dad both sheepishly looked at me. Instantly I become the talk of the town. I was so thrilled and happy, at last, bragging rights. And if I say so myself, I am very proud of my deer and myself. This is the first deer I have ever gotten by myself with no one else near me. I got him on my own and had no influence from anyone but myself. The main beams are 23 4/8 and 24. G2’s are both 17 7/8. G3’s are 10 3/8 and 11. G4’s are 11 4/8 and 12 1/8. It grossed 192 2/8 on a typical frame with only 2 4/8 deductions. 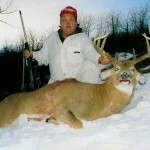 19″ non typical points for a net score of 208 6/8 non- typical. Thanks go out to Barry Englot, family friend and Lillian Rokosh of Rokosh Taxidermy for her wonderful taxidermy work. Pat McKensie for officially scoring my deer and to Ian Kenway for telling me about Lillian. 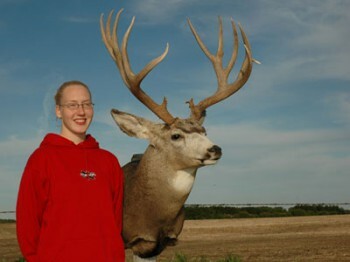 Also a special thanks goes out to Troy Haugen for letting me in on where the big bucks were. I would really like to thank my wonderful Dad, Don Partridge. He has made hunting with him a joy even if he always got bigger bucks them I did. He taught me everything I know and is always there for me. He has always been more excited about the smaller deer I got than the bigger deer he got. He is the best Dad in the world. Thank you so much. If it was not for all you had taught me I would never have gotten this big Mule deer.